What can I say? About five weeks ago I was reminded that we do have winter here even on the coast. 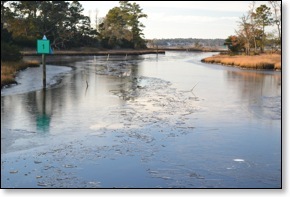 At the beginning of December, I wrote a post that said a cruel December might be on tap for the Crystal Coast. Our Boxing Day snow was just a start. Little did I know that the whole east coast was in for a record shattering month of December and that it would carry on into January. We got another snow on January 10. 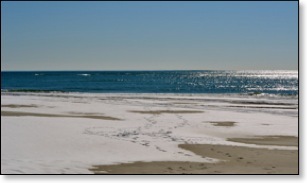 This snowy beach scene was taken over at the Point on January 23, the day after our third snow, a localized storm, dumped up to seven inches of snow along our beaches. As little as twenty miles inland there was no snow. New Bern and Greenville had sunny skies while we got a snow job. 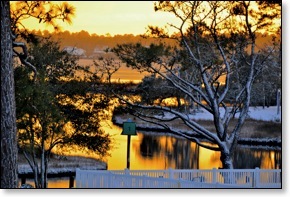 Has the Crystal Coast become a snow belt? It is unlikely, but three snows in one winter is really unusual. This snowless beach picture was taken just after New Year’s day when I was starting to think about 2011 and hoping for better year. It did not take long for the next storm to get on the horizon. Our second storm of the season arrived on January 10 and was not a bad storm since we woke up the next morning with our driveways and roadways clear. Still it was another snow in an area which is unaccustomed to snow. Last year on January 20, 2009 we had the first significant snowfall that the area had seen in six years. Then in early February we had another even larger snowfall. 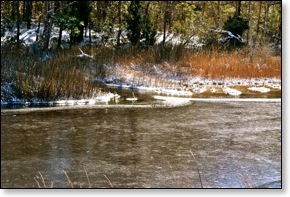 Now we have just had a third snowfall on January 22 here on the Southern Outer banks. We have been hit with so many storms that I might start losing track of them. Part of the good news is that they come one day and are gone by the next day at the latest. An usually long period of cold weather iced us in for a while, so I was not surprised when it started to get to me. Finally after watching the herons struggle to fish, I finally decided to go on an ice breaking mission. There are things I would rather do with my skiff that break ice, but i felt like it needed doing. We have continued to see some cold water with the river being as low as 36 or 37 degrees Fahrenheit. The only consolation is that until recently the cold weather stretched all the way to Florida. I am hoping after this current rain storm we will return to some quiet weather like we had just after the first of the year. Only I am counting on it being warmer. Now the most severe cold seems to be bottled up in the Northeast, and we are only on the edge of it but even that still seems to be enough to get us these coastal snow storms. Still our four inches of snow disappeared in a day, and places in New England are destined to get another 12-16 on top of snowfall that has already equaled what they get in a normal year. Areas around Boston, Massachusetts never made it into double digits on January 24. So it is hard to complain much about our high of 40 degrees Fahrenheit on the same day. Still it is over ten degrees cooler than our normal high temperature which is in the fifties. However, I have finally come to terms with this winter’s weather. I figure there is nothing we can do about the snow, so we might as well take these storms in stride. If you you just let the snow happen and not worry about it, even this last coastal storm turns out to be a not-so-bad snowstorm for our paradise. There are a lot of folks who might trade their snowstorms for ours. We don’t have to shovel our snow. It rarely sticks to the roads, and it just makes things look postcard pretty for a day or two and then it disappears. Our snowstorms are far better than Canadian snow which sometimes comes at the end of October and never leaves until early May. You get some pretty nice sunsets after our coastal storms. So all things considered, I have figured out how to enjoy the snow with the knowledge that we will surely survive until warmer weather. With all the cold weather, we really have had fun watching the herons, egrets, ducks and pelicans in Raymond’s Gut which leads to the White Oak River. I have managed to get some fantastic shots of everything from hooded mergansers to great blue herons. 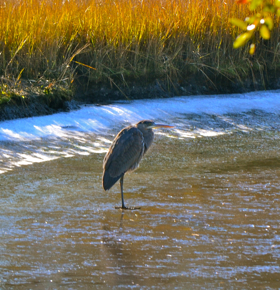 These are some pictures taken January 24 of a feathered fishing trip in the Gut behind our house. I even made a YouTube video of a skating blue heron. This afternoon I practiced a little heron noodling and managed to get some wonderful shots of a great blue heron. I actually was within eight feet of him before I had to shift in order to keep taking pictures. In moving my feet, I knocked a piece of driftwood from our dock into the water and spooked the heron. He was not very pleased with me and squawked the whole way down the gut to his fortress by the mouth of a small stream. 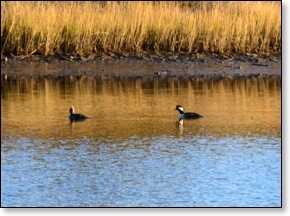 Probably the most unusual visitors have been the hooded merganser ducks that seem to drop by once a week. They are so different looking that they almost don’t seem real. At times it has been a real saltwater turf war with great blue herons, white herons (egrets), pelicans, and even sea gulls fighting for open water behind our home. Fortunately since the last storm, things have warmed up. Now all the area waters seem to be ice free. It helps when the temperature doesn’t drop below freezing which has been the case January 23 and 24. It is hard to believe I am saying that since our “normal” average low temperature is not below freezing even in January. I think the birds are pretty happy if the water manages to stay unfrozen along the edges. Their fishing efforts seem to be well rewarded, but like us humans I suspect they would like to see some warmer waters. We have a couple days with mid-fifties in the forecast this week so I hope to take my boat out for a short run on the river. I will be curious to see if we have had any improvement in the water temperature since my last ice breaking expedition when it was 37F. I would much rather be doing a video of the riding down the river than one of snowstorms. This is North Carolina so most years we can count on the winter starting to weaken shortly after the beginning of February. I usually plant my tomatoes by the third week in March so it needs to start warming up soon. In fact I am counting on it. I still have managed to go on lots of walks so we have not seen any dangerous wind chill situations. The ice on the gut going out Bluewater Cove is actually pretty minor. It is certainly nothing like the pack ice where I got stuck one spring on a ferry trip to Newfoundland. The cold weather has slowed the real estate business somewhat, but we have a number of clients whom I expect to see back when the weather warms. 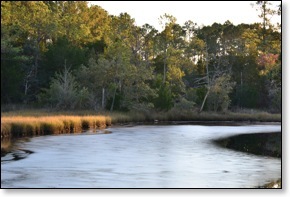 My real estate site has some great buys in coastal property. It doesn’t matter whether you want an inexpensive retirement home close to the beaches or a waterfront home with your boat just a few steps your deck, I can help you find the right spot. 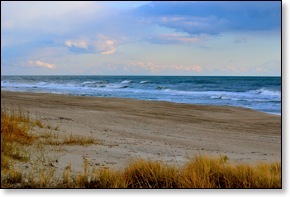 In spite of or maybe even because of our recent snows, the Southern Outer Banks is still a great place to live. It won’t be long, and we will be dreaming about some great warm days on the water. I can hardly wait. There is nothing like warm weather to provide more opportunities for great pictures and to give me a chance to try out some new features on my Droid. It is hard to say that any place is perfect. There always a balance between what you like and what you don't like. That also changes as you age. At one time I was close to homesteading in Newfoundland. Today I would steer you to my articles, Ten ways Carteret County met our needs, Why I love living in Carteret County, and to the Crystal Coast Electronic Village Homepage as answers to why we have chosen this area. From that reading it is easy to understand why we enjoy living in a small subdivision called Bluewater Cove near Cape Carteret. It is what we were looking for in a place to live. It is close to services and close to the beach but not on the beach. We have a dock behind the house and are close to some great trails. I can ride my bike in the neighborhood and not face a lot of traffic. I also use my kayak on the White Oak River and have learned to love exploring the river and surrounding waters with our skiff. This area also has some great festivals like the Newport Pig Cookoff, the Emerald Isle Saint Patrick's Day, the Swansboro Mullet Festival and the Swansboro Oyster Roast. We continue to be impressed with the Emerald Isle Christmas Parade. It is a friendly area with a great future. So right now it is the spot for us. I often write about the area in my other websites. If you are a very avid reader, you might find some similar content on multiple sites, but usually the content is fairly specific to the sites. These are additional sites might or might not be linked in the above post.